Lisa Kron’s 2010 play In the Wake, produced by The Comrades at the Greenhouse Theater, revisits the political events of 2000-2005 beginning with the Supreme Court decision in Bush vs. Gore. In the Wake is concerned with the ways American liberals, especially privileged white coastal liberals, develop blind spots that prevent them from fully understanding the life circumstances that might cause a person to cultivate a conservative viewpoint. This is a timely subject in the wake of Trump’s rise to power, although the play predates it. The play makes important points about the state of American political discourse though it is somewhat weighted down by an unwieldy structure. The play centers around a twenty-something woman, Ellen (Rose Sengenberger), a liberal New Yorker distraught about the 2000 election. 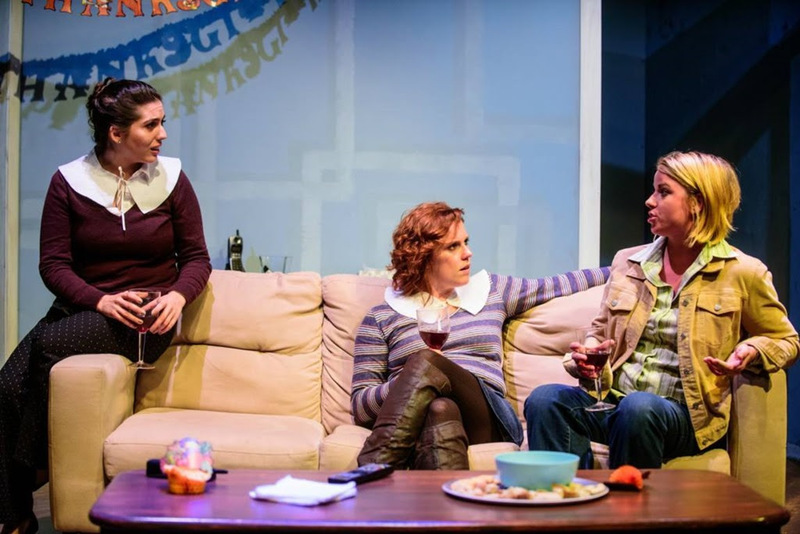 The play is populated by Ellen’s boyfriend Danny (Mike Newquist), his sister Laurie (Erin O’Brien), Laurie’s wife, Kayla (Adrienne Matzen) and their friend Judi (Kelli Walker). Ellen divides her time between non-profit work and traveling around the country making speeches about the unintended consequences of public policy. At an engagement at Harvard she reconnects with a childhood friend, Amy (Alison Plot), and they begin an affair. Unwilling to leave her current relationship, Ellen asks Danny to accept her involvement with Amy, and perhaps in the wake of some guilt about his own long since confessed infidelity, he resigns himself to the fact his girlfriend is in a second relationship. Meanwhile Amy falls madly in love with Ellen and begs her to leave Danny. But Ellen is in denial about how much emotional damage she is inflicting on both her lovers. Meanwhile, Laurie and Kayla strongly disapprove and their relationship with Ellen is badly strained. The best moments zeroed in on Ellen’s relationships. Alison Plot’s performance as Amy was a highlight. Plot does a nice job of portraying the agonizing experience of loving someone who is emotionally unavailable. The brief but touching love scene between Ellen and Amy is one of the most engaging moments of the play. And when Ellen makes things worse with empty platitudes about holding Amy in her heart, Amy’s pain feels very real. Kelli Walker’s performance as the world-weary Judi is also notable. Judi brings perspective about growing up poor in a small conservative town and then spending her career abroad working in refugee camps. Walker’s deadpan delivery also brings some much needed humor into an otherwise very serious play. Ellen’s character mainly talks at her friends and family, this is by design. The point of the play is that Ellen sincerely believes if other people just had the same information they would always agree. Rose Sengenberger plays Ellen as passionate and earnest so we understand it is not malice on her part but rather an astounding lack of self awareness, which Kron uses to make a point about the way liberals have contributed to the bitter partisanship that is dividing our country. Unfortunately Ellen’s long speeches have the impact of slowing down the pace. To compound this the action is broken up by news clips and direct address monologues giving this two hour and twenty minute show a choppy stop-and-start effect. The play relies heavily on historical footage to establish what’s happening in the outside world. But news clips alone, though they might have an emotional impact, are not inherently dramatic. Unfortunately, the current events in the play often feel like a backdrop, rarely integrated into the story in a way that impacts the lives of the individual characters. What I was really missing from the play ultimately was a connection between the personal and the political. There are two plots but they don’t intersect or illuminate each other in more than an abstract way except for a very brief conversation about 911. For instance, in a surprising omission, although the play is set pre-marriage equality, little is said about the fact the fact Laurie and Kayla’s marriage isn’t legally recognized. The practical and emotional hardships this situation created go unmentioned. This is one example of a place where the play could’ve connected the dots between its character’s hopes and dreams and the political landscape of the country at that time. In spite of these structural and story challenges, the cast brings a lot of heart to their performances and the play makes an important point. That Americans of all political persuasions could do better job of listening to opposing viewpoints.